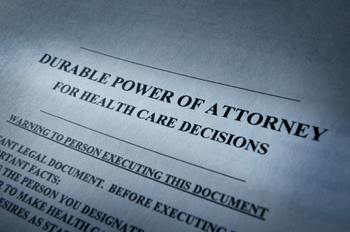 Few decisions are more personal -- involving both health and death -- than those embodied in an advance health care directive or a living will, or a similar document. Some individuals want their lives prolonged by any means necessary, while others prefer that medical treatments be withheld, allowing for a natural death. An advance health care directive lets caregivers and family and medical providers know a person's healthcare wishes if he's unable to speak for himself. The document can also appoint someone else to speak with legal authority for the person if he's unable to do so for himself. It's not easy to bring up the subject of dying (especially if it's your parent you're caring for). But you, the individual, and the rest of his family will gain some peace of mind if you can get him to start thinking and talking about this subject, and eventually to execute documents that set down his wishes. One way many people get this discussion started is by showing the person the advance health care documents they've prepared for themselves. This both breaks the ice and gives the person a model on which to base his own documents. The job is to get him thinking about what will be important to him when he is incapacitated, and particularly when he's dying, such as where he wants to be -- at home if possible, or in a hospital -- and what treatments (particularly life-prolonging ones) he wants and doesn't want. He also needs to think about who he wants to make decisions for him if and when he's unable to do so himself. But remember that a conversation doesn't have the same legal force as an advance health care directive or similar written document, even if a doctor records it. In most states, only a written, signed, and witnessed advance health care directive legally must be followed by healthcare personnel and institutions. Sometimes a trusted friend will make more objective decisions, or will follow the person's wishes more carefully, than a family member. Whomever he winds up choosing, he has to discuss the responsibility with that person and make sure she's willing to accept it before naming her in the document. Generic advance health care document forms are available from many sources, but the forms are designed to be planning tools only. They don't offer a final product -- the forms are meant to trigger but not replace communication between the person in your care (the principal) and the designated decision maker (the agent). Though there's no single form that must be used for an advance health care directive, an individual should use his state's standard form if it has one. He should also follow his state's signature and witness requirements. For example, most states require two witnesses to the person's signature; some states also require notarizing the document. In most states, witnesses cannot include relatives, heirs, medical providers or their employees, or anyone responsible for the patient's healthcare costs. If the person in your care is in a nursing home, some states require a state nursing home ombudsman or patient advocate to witness the signing. Encourage the person you're caring for to revisit their advance health care directive periodically, as long as he's able to do so. His feelings and choices may evolve as his situation changes -- for example, after he's diagnosed with a serious illness, or as he witnesses others going through the end of life. If he does execute a new document, he should send a copy to every person and institution that has a copy of the previous one, explaining that the new one replaces the old. In most cases, completing a new advance health care directive automatically revokes all previous directives, but it's always a good idea to let everyone know personally.